So when it comes to writing a devotional, it’s helpful to have clarity. The word has become a catch-all term among people of faith. You may use the term when you talk about the time you set apart to pray, read the Bible, and meditate. The word describes a specific kind of book or magazine you may use during your daily quiet time. It’s a collection of short pieces of inspiration. A devotional is a short piece of inspiration. Some writers refer to these pieces as “mediations” or even as “devos,” using the abbreviated term that’s so popular with students. It is a unique form for two reasons. By short, I mean devos are generally 150-500 words long. On average the total word count clocks in at 200-250 words. There is a good reason for brevity. Devos are designed to inspire the reader to apply a biblical principle. A good devo uses one idea from the Bible and gives an example of how that idea is lived out. 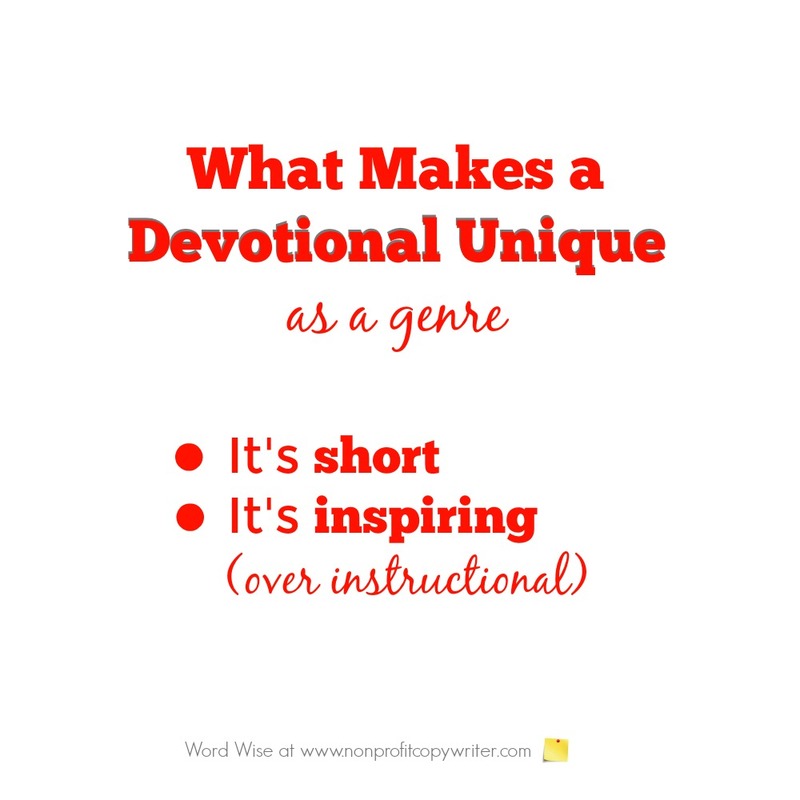 A devo is a short piece of inspiration – not a short piece of instruction. This is an important distinction. A good devo sheds light on a particular biblical principle and shows one way God has made it real. It connects the events of real life to scripture. It is that connection factor that makes devos so powerful. It shows how one facet of God has been experienced in another person’s life. A devo does not tear apart the scripture (the way you might find in a sermon or Bible class) by looking for cross-references and seeking to uncover its theological, historical, and cultural context. That is not to say that a reader won’t learn more scripture from reading devos. He will. But instruction is not the goal. People like to read about and hear about other people. It’s encouraging when others share how God has used a particular situation to impart a deeper understanding of who He is. It’s authentic. It’s personal. A well-written devo can help a struggling mom see how another mom had patience with her pre-teen and point her to a scripture to help her in the moment. A well-written devo can point a college student to a passage he’d never read and open the way for him to read the entire chapter. A well-written devo can move a busy executive to take a few moments of thanksgiving and praise just before a fast-paced day. A devotional communicates scriptural truth – just one truth, since the devo is short – in a way that inspires the reader to a closer relationship with God.